I purchased the hair dye in burgundy and I LOVE IT! My “before” picture was after I had colored my hair with henna powder from brand “x” and Turkish coffee, which really messed it up. 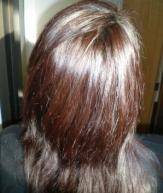 I have black hair (I’m Asian) and this method turned my hair a faded brown. 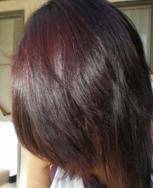 My “after” picture,is after using your burgundy hair dye. It gave me the exact color I wanted! I will definitely purchase from you again, without a doubt! Not only did I get a wonderful color, my hair is extremely healthy and seems to be growing out really fast! I have been recommending your product to everyone who asks about my awesome hair!